Count Spectacular is a bloody cool slot game allowing you to feel the thrill of Medieval Castles right at home. 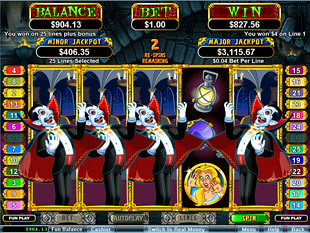 Just try this slot machine developed by RTG in 2010, and you’ll face the thrilling Count Spectacular himself. If you are brave enough, and if you have a nice piece of luck, you’ll get really nice prizes including the incredible top jackpot of $50,000. This slot machine has 5 reels and 25 winning lines, so you have a lot of ways to make a lucky match. The game also offers you two progressive jackpots. They are Minor Jackpot and Major Jackpot starting from $100 and $1,000, respectively. Both of them can grow into really enormous sums. You should be always ready to get these amazing progressives, as they are awarded randomly. The wild symbol of this game is the Count Spectacular himself! He can appear on reels 1 and 5 to help you make a lucky match. This icon substitutes for any other one, except the scattered Castle. If you are lucky to catch two Counts on reels 1 and 5 at once, you’ll get into a Count Spectacular Bonus Feature. Sounds great, eh? Ain’t that enough for you? Then try and match several scatters! 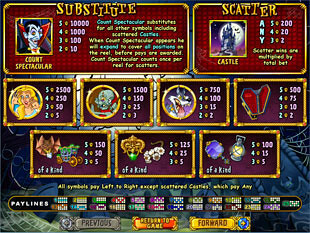 The scattered symbol of Count Spectacular Slots is Castle, and it appears anywhere on the reels – even out of paylines. When you match 3, 4 or 5 Castles, you get your total bet multiplied 2, 20 and 200 times, respectively. This means you can win up to $25,000 for only one lucky scatter spin! Amazing! This is Amazing! Making bets at Count Spectacular Slots is a whole lotta joy! You can vary coin values and the number of active paylines. To change the size of your bet choose 1-25 paylines, and one of 15 coin sizes including $0.01, $0.02, $0.03, $0.04, $0.05, $0.06, $0.07, $0.08, $0.09, $0.10, $0.25, or more risky $0.50, $1.00, $2.50, $5.00. If you are a real risky High-Roller, you’ll surely try the maximal bet of $125. This stake is quite big, but also gives you a lot of chances to win a jackpot, so it’s worth trying. Anyway, if you want to relax without any rushing blood and hot emotions, try to bet the minimum of $0.01 and you’ll feel the joy of real slots game without any money races. In Count Spectacular the top jackpot is 10,000 coins or $50,000. To get this amazing sum, just strike a combination of 5 wild Counts. 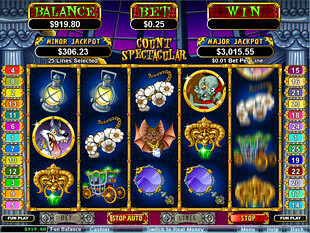 Besides the described stunning features, Count Spectacular also offers you a couple of fantastic bonus modes. The first of them is Count Spectacular Bonus. It is triggered by two wild icons appearing on reels 1 and 5 simultaneously. In this feature you can choose either Free Spins or Re-Spins, but it actually doesn’t matter, as both these bonuses are really rewarding. You only choose the way to win a lot. The first option gives you 12 Free Spins. And this is not the end! Every win (yes, every single win) you get during this bonus feature is multiplied by 3! It’s AMAZING! You can get up to $150,000 for only one line match! The other feature gives you 4 Re-Spins with stacked wilds frozen on reels 1 and 5. This gives you a really huge number of lucky matches! Whoa! What a bonus! Count Spectacular Slots gives you tones of joy while playing! 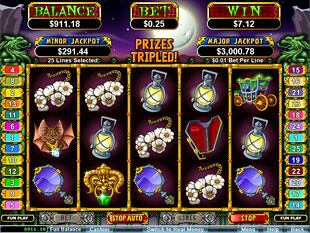 You can win two Progressives, Free Spins, Re-Spins, or simply enjoy stunning graphics and big choice of bets. The game is great both for low- and high-rollers, and unites many great features into a single slot machine giving you crazy cashbacks! Try Count Spectacular Slots, and you’ll enjoy every second of playing this great game!